(a) Closed die forged components have made possible many design to accommodate higher loads and greater stresses. (b) Due to close tolerances, automated machining lines can be used to machine these at faster rate. (c) Because of the use of hot-rolled products as input, reliability of internal structure is ensured. As indicated earlier, grain flow characteristics of closed die forgings give improved properties of strength, ductility and resistance to impact and fatigue. (d) Because of the controlled sequence of production steps consistency of material composition and structure is assumed from piece to piece, and better response to heat treatment is achieved. (e) With the elimination of internal discontinuities, low rejection rates, better machinability, less machining allowances--cost of production of aggregates is reduced considerably. (f) Saving in weight of parts is achieved due to the inherent characteristic of higher strength to weight ratio. Therefore, many models of auto and trucks contain over 200 separate closed die forgings. 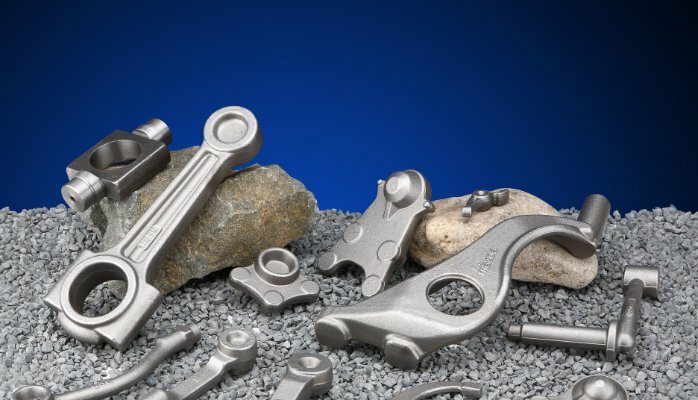 Engine components: crank shafts, connecting rods, rocker arms, cam shafts. Transmission: gear blanks, gear shift levers, drive shaft, main shaft, propeller shaft yokes, flanges brake levers. Steering: steering knuckle, steering shafts, steering levers, pitman arms. Front axle: front axle beams, stub axles, front hubs. Rear axle: rear axle shafts, differential cases and covers, crown wheels and pinions, differential gears, etc. Billet heating (to around 1250°C) is done in forge furnaces which may be either box type pusher, walking beam, rotary hearth or induction furnaces. Reduce-rolling is done to distribute the metal to suit forging shape in a separate rolling machine. Flattening, bending, blocking and finish forging operations are done in the main forging unit i.e Press or a Hammer. Trimming and hot coining operations are done on auxiliary units. Heat treatment, shot blasting, grinding, etc are the finishing perations, which are done in separate equipments. Automotive forgings are made by close die forging process and hence it is essential to elaborate the various features of this technology. In the first instance designs of the forged part, die and tool design are to be considered. Broadly speaking, adding material around the contours of machined piece profile constitutes the design of forged part. Thanks for sharing this useful information. I really appreciate your efforts and keep update.